Former Quezon Rep. Mark Enverga now has the most powerful person in the land backing his comeback bid. 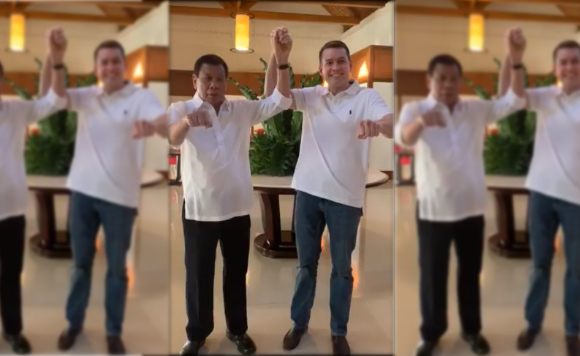 On Facebook, Enverga shared a video of President Duterte raising his hand and telling people to vote for him for congressman as they did the signature clenched fist post of the chief executive. In his post, Enverga thanked the President for his support and vowed to continue to bring progress to Quezon’s first district. Will this endorsement propel him to the winning circle? “#markenvergaforcongressman Maraming Maraming Salamat po sa pagtitwala ninyo mahal na Pangulong Rodrigo R. Duterre. Asahan po ninyo ang Pagpaptuloy po natin ng pag #Sulong pa More ng unang Distrito ng Lalawigan ng Quezon! 👊👊👊👊,” Enverga posted.